DigiLocker is an important service and operated by the Government of India. It enables Indian citizens to store certain official documents on the cloud. The service is aimed towards reducing carry or use of the physical documents, and it is part of the government’s Digital India initiative. In this article we have to discuss how could you easily get Online DL, Vehicle RC via DigiLocker. DigiLocker is an important and useful platform for issuance and verification of documents and certificate in a digital way, thus eliminating the use of physical documents. 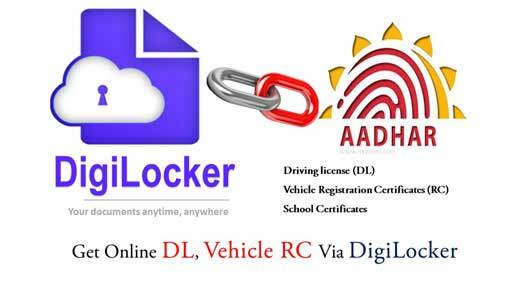 You can easily get online driving license, vehicle registration certificates via DigiLocker website or Android app. DigiLocker is directly integrated with National Register. You can get online DL, Vehicle RC data across the country without any extra effort. DigiLocker is a platform for issuance and verification of documents & certificates in a digital form, thus eliminating the use of physical documents. All Indian citizens who sign up on DigiLocker account able to get a dedicated cloud storage space. The cloud storage space linked with Aadhaar (UIDAI) number. Organizations that are registered with Digital Locker can push electronic copies of documents and certificates. You can get driving license, Voter ID, School certificates directly from citizens lockers. Citizens can also upload scanned copies of their legacy documents in their accounts. These legacy documents can be electronically signed using the eSign facility. Citizens can access their digital documents like driving license, vehicle registration certificate anytime, anywhere and share it online. This is convenient and time saving. You can easily share the authentic digital certificates directly from the data source with other departments as identity and address proof. It reduces the administrative overhead of Government departments by minimizing the use of paper. Digital Locker makes it easier to validate the authenticity of documents. These documents directly issued by the registered issuers. Self-uploaded documents can be digitally signed using the eSign facility (which is similar to the process of self-attestation). Step 1: Open the DigiLocker website. Step 2: If you don’t have any account then first create your account on DigiLocker website. To create new account click on the Sign Up button. If you already have an account on this website then click on the Sign In button. Now, fill the username and password to open your account. All digilocker users remember one thing that they should link their Aadhaar card number with DigiLocker account. Step 3: After successfully opening your DigiLocker account click on the “Issuers” option. This option is located in below the DigiLocker Network option. To pull your documents, you can click on “go here“. If you need For more info, please click on the “see this link”. Step 4: In the Pull documents, select the partner name and document type which you get online verified document. For e.g. To get online documents from DigiLocker, Select “Ministry of Road Transport and Highways, All States” in Partner name. Just like this select “Driving Licence” or “Registration of Vehicles” option in Document type. Step 5: You can automatically get your name and date of birth. To get driving license or vehicle registration then fill registration number and father or husband name. Now turn on check mark, finally click on the “Get Document” button.